A trail left by an incoming meteorite above the Russian town of Chelyabinsk, in 2013. Scientists are using bursts of light on the moon in an effort to get a better handle on the risk space rocks pose to Earth-orbiting satellites, spacecraft, a possible lunar base, and people here on the ground. Called lunar flashes, these pinpricks of brilliance mark the impact of small, or sometimes not-so-small, asteroids hitting the lunar surface with enough force for the consequent explosions to be seen from Earth. The first reported observation of such a flash may have come in June 1178, when a group of English monks describedthe “horn” of the moon as being split in two. “The story of these monks was popularised by the Cosmos television series in the 1980s,” says Jorge Zuluaga, an astronomer at the University of Antioquia, Medellín, Colombia. It is possible, he adds, that the monks saw the impact that formed 22-kilometre-wide Giordano Bruno crater, a geologically recent scar near the edge of the Moon’s disc, as seen from Earth. If so, it was a large blast indeed. “The energy of the impact was probably thousands of megatons, which implies that what the monks saw was the largest explosion [other than solar flares] ever witnessed by human beings in history,” Zuluaga says. The asteroid that did it, he adds, was probably 100 to 1000 metres wide – large enough that we were lucky it wasn’t the Earth that got hit. In 1178, only a truly large flash could have been seen from Earth. Today, a European program called NEO Lunar Impacts and Optical Transients (NELIOTA) is using a 1.2-metre telescope at the National Observatory of Athens in Greece to spot impacts from near-Earth objects (NEOs) perhaps as small as billiard balls. Because glare from the moon’s daylit surface overwhelms NELIOTA’s flash detectors, the program only watches during its crescent phases, when most of its surface is dark. Already, however, it has detected 57 flashes in only a little more than 90 hours of viewing time, says Alceste Bonanos, an astronomer at the observatory. She recently reported her findings at a conference in Darmstadt, Germany. Another flash was observed by astronomers in the Americas and Spain during the total lunar eclipse of 21 January 2019. It drew a great deal of media attention because it occurred at a time when millions of people were watching the moon, although most didn’t have telescopes to see the flash. Extrapolating to the moon as a whole, Bonanos says, there are probably about seven impacts per hour bright enough for NELIOTA to spot, or about one per five million square kilometres. That doesn’t sound like many, but with 8760 hours in a year, the odds add up. Furthermore, there are probably a lot more impacts from pebbles too small for NELIOTA to see. Similar rocks, of course, also pelt the Earth, producing meteors and fireballs as they streak across the sky. And while most of these are small, some are not. In 2013, a 20-metre space boulder exploded above Chelyabinsk, Russia, blowing out windows and injuring almost 1500 people, mostly with flying glass. And on 1 February 2019, a 360-tonne rock (therefore about 40 times less massive than the Chelyabinsk chunk) exploded over western Cuba. This time nobody was hurt, but hundreds of fragments fell to the surface, some reportedly landing on houses. But it’s hard to study these from Earth because, looking up from below, we have a fairly small field of view. There’s just one problem. When we see a lunar flash, what we’re seeing is the energy of the explosion, which is a function of both mass and velocity. A bright flash might be the result of a small object moving rapidly, while a dimmer one might be from a larger object moving more slowly. “The sizes [of the impactors] are somewhat uncertain,” Bonanos agrees. One solution, she suggests, is to observe lunar flashes during meteor showers, in which the speed and direction of all the particles in each swarm are well known. But events like the Cuban fireball may also help sort this out, thanks to a method called gravitational ray tracing developed by Zuluaga’s team. Gravitational rays have nothing to do with gravity waves, which astronomers use to study distant space events. Rather, gravitational ray tracing uses mathematical tools developed in the animated-film industry to assess thousands of possible speeds and lines of approach (that is, rays) from which an impactor might have arrived. It then back-traces the orbits associated with objects coming in on each of these rays and compares them to those of NEOs large enough to have been found by telescopes. If a ray traces to a region where no large NEOs are known, it is unlikely that it would also be the source of a smaller rock. If it traces to a region known to be teeming with NEOs, then that ray gets a thumbs up. The array of likely candidates gives an approximation of the impactor’s probable orbit, and from that its speed and – from the energy of its impact – its mass. Using this approach, Zuluaga’s team determined that the January 2019 impactor – which produced a blast equivalent to 0.3 to 0.5 tonnes of TNT – was most likely a basketball-sized rock massing between seven and 40 kilograms, hitting at a speed of about 14 kilometres per second, or about 50,000 kilometres per hour. But that’s just a theoretical calculation. When the Cuban fireball hit a few days after the total eclipse, Zuluaga realised he had a perfect opportunity to test his method. The Cuban fireball had come in during broad daylight, leaving a smoke trail filmed by dozens of tourists. That made its actual speed and trajectory easy to calculate. Zuluaga then applied his gravitational ray tracing technique to an impactor hitting at the same time and place, pretending he didn’t already know the true answer. When he compared the two, they matched. 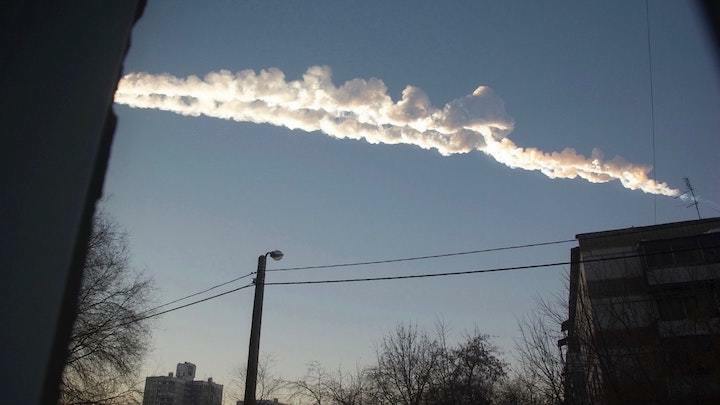 Curious, the team performed a similar calculation with the Chelyabinsk impactor, and again found that their calculations compared closely to the speed and direction revealed by that impactor’s trail across the sky. That makes, of course, only two case studies, but it’s a sign that Zuluaga’s method might also work for objects hitting the moon. Technology is still a long way from being able to detect fast-moving rocks and pebbles before they might strike a satellite or lunar base. Nor is yet possible to give warnings for fireballs like those in Chelyabinsk and Cuba before they are already visible. “The relatively small size of meteoroids like those that fell in Chelyabinsk and Cuba make them practically undetectable before impact,” says Pablo Cuartas-Restrepo, a colleague of Zuluaga’s at the University of Antioquia. But potentially hazardous meteoroids come down over populated areas more frequently than people once believed. In 2004, a 1.3-kilogram rock plunged through a roof and crashed into a couch in a suburb of Auckland, New Zealand. And when he scoured the records, a man named Walter Branch found 124 such events prior to 2006, dating to as far back as 861, when a meteorite reportedly punched through the roof of a Japanese shrine. “Sadly, we are not yet able to defend our society against this threat,” says Mario Sucerquia, a third member of Zuluaga’s team. But it should be possible, he adds, to calculate impact probabilities at various places around the globe, at least in populated areas. “This may help us take preventative measures,” he says.